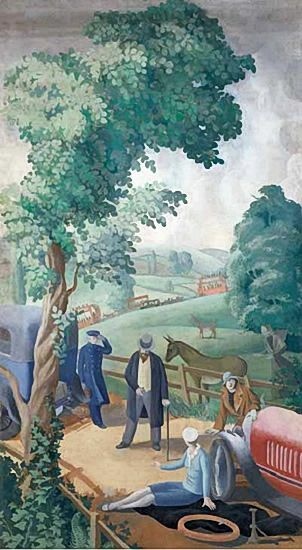 Mary Adshead studied at the Slade School of Fine Art (1920–24) under Henry Tonks (1862–1937), who in 1924 selected her for a mural commission at Highways boys’ club in Shadwell, working with Rex Whistler (1905–1944). She became a prominent muralist, creating decorations for both public and private spaces, including the British Pavilion at the 1937 Paris International Exhibition. She also illustrated several books, such as The Little Boy and His House by Stephen Bone (1904–1958) (whom she married in 1929), and made designs for London Transport and the Post Office. 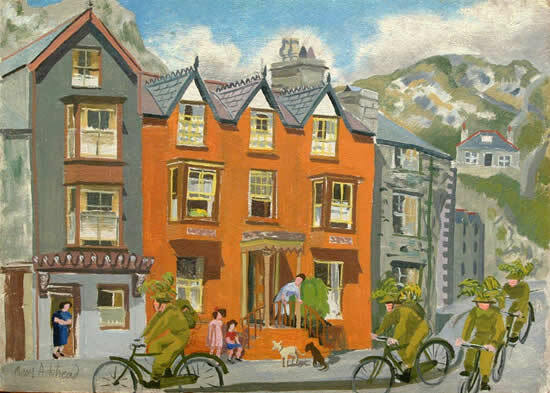 As a noteworthy female artist, Adshead exhibited frequently at the WIAC from the mid –1930s, before serving on their committee in 1951. Working at a time when expectations of women were still largely confined to issues of domesticity, her prodigious professional output was noteworthy. Her approach to mural painting – especially in her choice of subjects and her colourful palette – challeged the perceived divisions which determined that public and private spaces should necessarily be treated differently. She was the subject of a retrospective at Liverpool Art Gallery in 2005.